A manicure is one of those simple pleasures no girl should have to live without. Aside from the obvious princess pampering, glossy nails are a fast and easy way to add pizazz to any look. My weapon of choice is OPI nail polish. 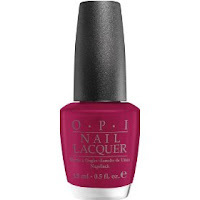 With their eclectic names and ridiculously wide range of colors, OPI should be every girl's go-to brand. The polish seems to stay on longer than any drugstore brand and the names make the choosing game even more fun. I tend to go through color phases. The winter weather usually has me donning Miami Beet, but my color palette has recently expanded. Straight from the Brights Line, my new obsession is OPI Ink. Too bad I only discovered this perfect-for-chilly-weather gem last week. For Spring's warm weather, I recommend Dim Sum Plum for the hands. This bright purple will add a needed oomph to any wardrobe. Not to neglect the pedicure, the new Spring feet must have is Jade is the New Black. This very trendy shade can only be worn by true nail connoisseurs and fashionistas. Remember ladies - if you've got it, flaunt it. You can also try out Over the Taupe. This new shade looks darling on most, but blends into my olive skin in a not-so-flattering way. If you're in Toronto and looking for an A-List polish application, head over to Nails by Design. Mary, Tran and Thi have the best hands in the business.